Tech & Learning's Tech Forum Texas will take place at the Hilton Austin Airport in Austin, TX on Thursday, November 7, 2013.We have arranged for preferred hotel rates for Tech Forum participants. Whether you are traveling for business or leisure, experience Austin, Texas amidst the comfort and convenience of the Hilton Austin Airport. "The Only Hotel on Austin Bergstrom International Airport Grounds (AUS)" the hotel is a mere two minutes from the passenger terminal and features complimentary shuttle service.Moreover, transportation to downtown via the Airport Flyer is available seven days a week, stops directly outside the hotel, and takes passengers to the heart of downtown -- 7th Street and Congress – near major attractions including the University of Texas, Austin Convention Center, 6th Street, 4th Street and the Warehouse Entertainment District, Austin Museum of Art, State Capitol Complex, Bob Bullock Texas State Museum, IMAX Theatre, LBJ Presidential Library, and the Austin Children's Museum just to name a few.The flyer provides service from the hotel every 45 minutes for only $1.00 round trip! 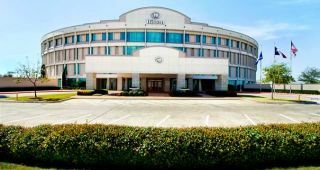 Not only does the Hilton Austin provide uniquely convenient proximity to the airport, it also is a destination unto itself housed in a historical building previously utilized by the United States Air Force as a strategic air command center during the Vietnam, Persian Gulf and Desert Storm wars. The unique architecture coined the building’s nickname as the "donut" due to the completely round shape of the facility. Boasting over 70,000 square feet of versatile indoor/outdoor meeting space, 18 state of the art meeting rooms and more, the Hilton Austin Airport provides an ideal environment for focusing, learning and networking at conferences/professional development events along with complimentary Internet in the Atrium.Guest rooms enhance the comfortable working environment with high-speed Internet access (HSIA), large/ergonomic desk and chair with desk level electrical and data port outlets.Enjoy MP3/IPod connectivity as well as HBO/On Demand TV while relaxing in Hilton’s Serenity® luxury bed package with high thread count linens and more.Expect the Best! The Hilton Austin Airport hotel offers outstanding service that will go above and beyond your expectations. From the moment you arrive to the time you check out, the staff will ensure your entire stay is a success. Location & Directions: The Hilton Austin Airport is located off of highway 71, two miles east of Highway 183, three miles west of 130 Toll Road, and minutes from I-35 and MoPac Expressway and only 7 miles from downtown Austin. Parking: The Hilton Austin Airport is offering complimentary self-parking for Tech Forum attendees. Valet parking is available for $20.00 per night.